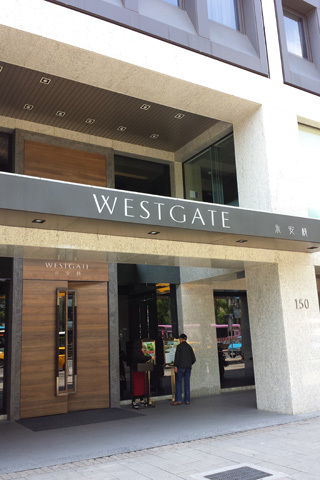 Westgate Hotel (永安棧) was still under construction when we last visited Taiwan in 2012. 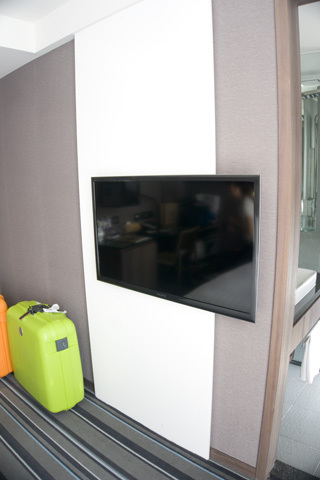 Armed with an unbeatable location, it would be a top choice if you are planning to stay in Ximending. 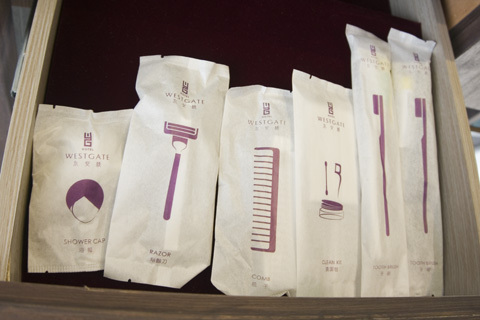 That is, if the price is not an issue because it is slightly pricier compared to the other options in Ximending. As our visit to Taiwan this time was a family trip together with our parents, a convenient location was a top criteria when it came to choosing a suitable property. 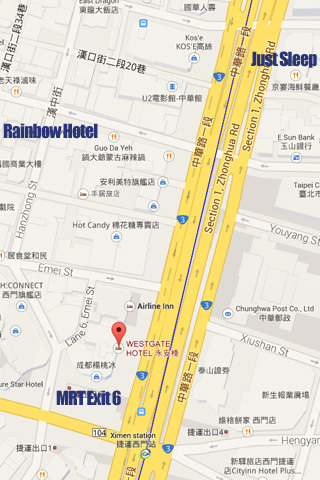 From Ximending Station, one would typically use Exit 6 and from there, it is a mere 1-minute sheltered walk to the hotel. It is also facing the main road which provides convenient access to cabs. 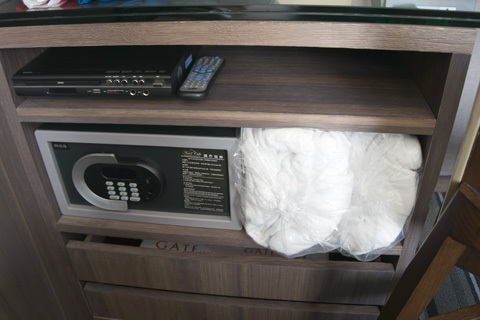 Simply tell the cab driver you want to alight at Ximending Station if they are not familiar with the hotel. Our first two stays were at Rainbow Hotel, while our third stay was at Just Sleep Hotel. 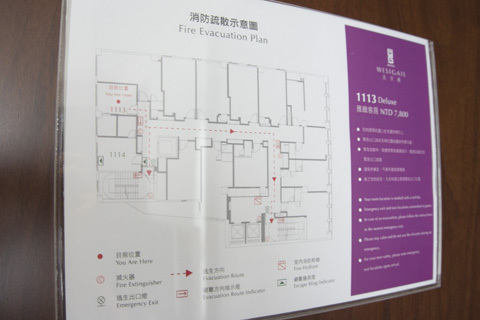 Previously, when we stayed at Just Sleep Hotel, we would use Exit 5 which is roughly 3-minutes walk via the underground passage from Ximending Station. Pushing through the rather solid and heavy main door (usually there would be a staff stationed there), we stepped into the hotel which actually had a decent lobby. 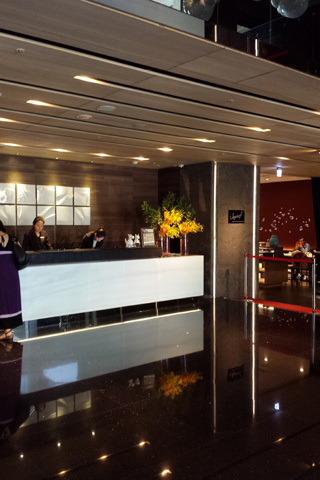 Many hotels are too small, with only sufficient space for reception counter. Beside the front desk is the dining area where buffet breakfast is served. The gym is located at the second level. 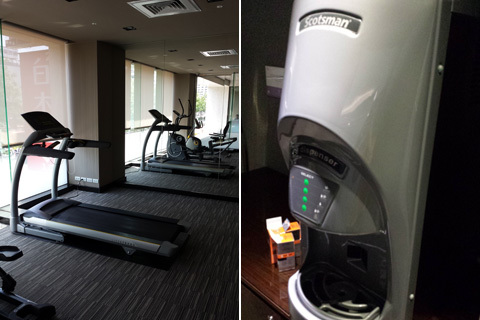 Didn’t spot anyone using the gym or business centre during my 5-night stay at the hotel though. Need some ice cubes? Help yourself to the ice-machine outside the gym. 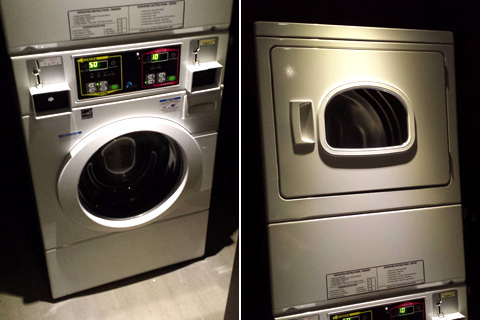 If you need laundry services, there is a washer and a dryer too. For our stay, we reserved two rooms that are beside one another. 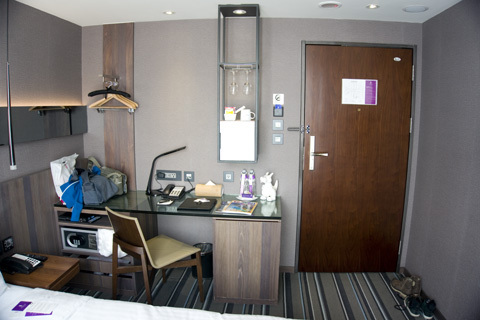 Our room type was a Deluxe Room – room 1113. Located at a corner that is furthest away from the lift area, it was relatively quiet. 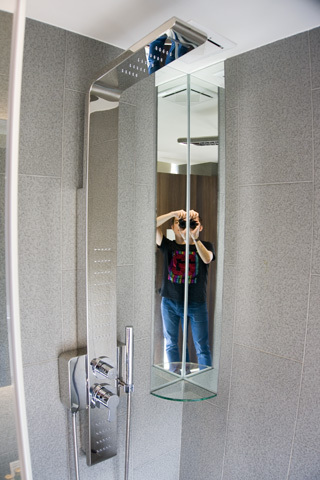 While not spacious, at 20 sqm. the room is comfortable for 2-pax. To save space, there is no wardrobe and an open-concept is adopted. Westgate Hotel thoughtfully provided pineapple pastry, which unfortunately didn’t taste that good. For truly awesome pineapple tarts, check out Chia Te Bakery. 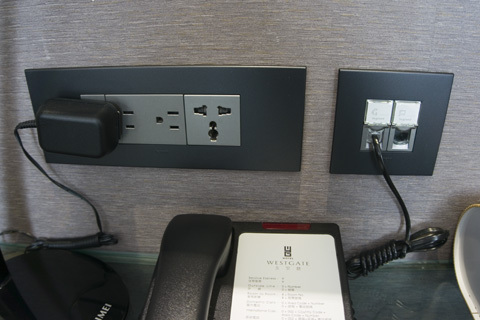 Don’t fret if you forgot your travel adapter, the power socket has already catered for your needs. 40-inch Sony wall-mounted TV. Ample space in front of the bed for opening our luggage. 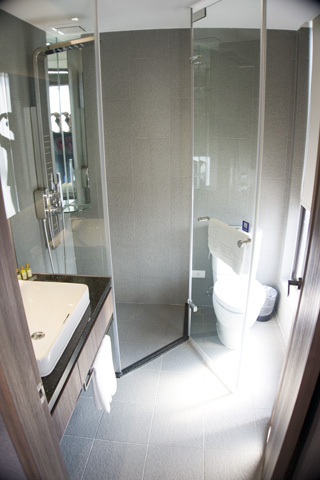 Like the bedroom, the bathroom is brightly lit with natural light which gave the illusion of spaciousness. 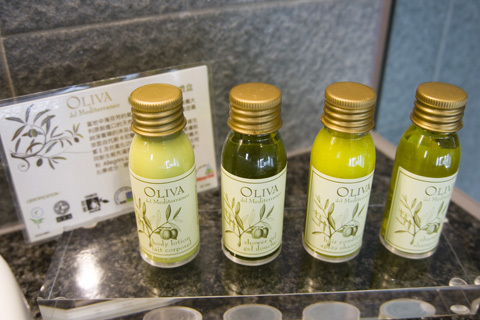 Premium bathroom accessories and Oliva bath and shower set. 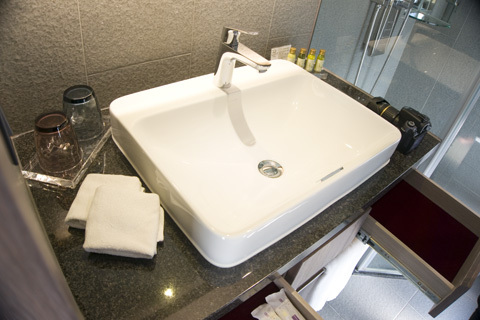 Various amenities are available – you don’t have to prepare anything! Last but not least, a soothing rain-shower with massage jets so you can have some fun when you bathe. 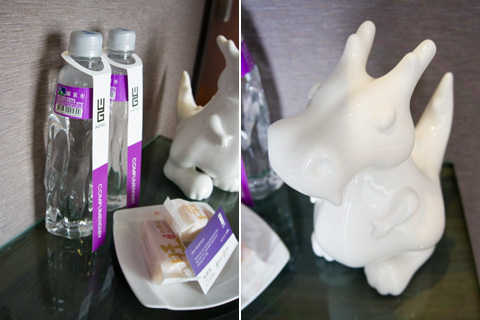 We bumped into the housekeeping staff on a daily basis in the hallways and were always greeted warmly with trademark Taiwanese hospitality. 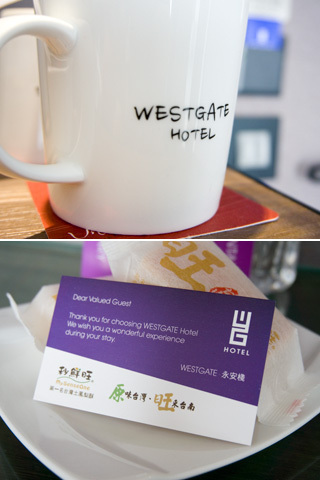 Overall, I would say Westgate Hotel is a lovely hotel to stay in with a great location, easily the best we’ve tried in the Ximending district of Taipei. 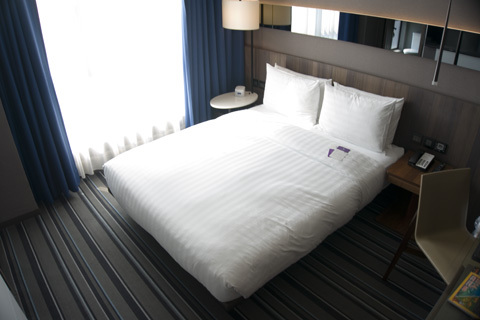 If location is your top criteria, there is no better hotel in Ximending. Oh, did I forget to mention they have a pretty decent buffet breakfast with unlimited supply of 滷肉飯?